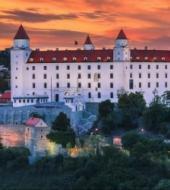 See the scenic capital of Slovakia, first by guided walking tour, then by speedboat along the Danube back to your original destination. Your trip to Bratislava, the scenic capital of Slovakia, begins by modern public transit bus at 8:30 am. Your guide for the city walk will be waiting for you upon arrival, and will take you through the picturesque old town. After lunch, you´ll have plenty of time to stroll around and shop. At 4:00 pm, you return to your orginal location via the Twin City Liner speedboat. Experience the sensation of traveling at high speed, and at the same time enjoying supreme, fully air-conditioned comfort. After passing through the untouched and protected Danube River wetlands and National Park Donauauen, the tour ends at Schwedenplatz at 5:30 pm. • Boat trip back to Vienna by catamaran "Twin City Liner"-On request free pickup from your hotel and transfer to the departure point. • This tour is available in German and English. Please indicate the language of the tour you would prefer. • A valid passport (or ID for EU citizens) is necessary! • Please arrive 15 minutes prior the tour. The tour starts at 8.30 a.m.
Or our complimentary hotel pick-up service will bring you to our Tour Center where your tour officially starts.